"A classic case of the chase being more exciting than the catch"
"Who put us here?" "What's out there?" "You don't get it - we're already dead." You'd think that a movie so divinely earnest in evoking a sense of existential dread would have a bit of an identity crisis, but that's not the case with The Maze Runner. Wes Ball's scrappy little adaptation of a popular YA book by author James Dashner hits most of the notes you will be used to: futuristic setting, omnipresent enemies, youngsters forced to face adulthood abruptly, and a protagonist who pops up, brave enough to shake up the status quo. But it ends up being more than the sum of its parts. The Maze Runner doesn't so much embrace these genre clichés as gently brush pass them whilst sprinting on to the next story beat. It may be a hodge-podge of better books and movies that came before it, but it's so delightfully sure-footed for much of its near two-hour run-time, it's near impossible not to get swept up in the chase. And it means business, too. From minute one, screenwriters Noah Oppenheim, Grant Pierce Myers, and T.S. Nowlin get things moving at an alarming rate. Dylan O'Brien's Thomas finds himself trapped in The Glade, a shabby little community of fellow thirteen-to-eighteen year-olds who all face the same problem: they can't find a way out. The Glade, it turns out, is enclosed on all sides by a monstrous maze. Each morning four doors on each side of The Glade open, allowing the Runners to memorize and map out its secrets. Each night, however, they close, leaving any stragglers to suffer at the hands of the deliciously monstrous Grievers. 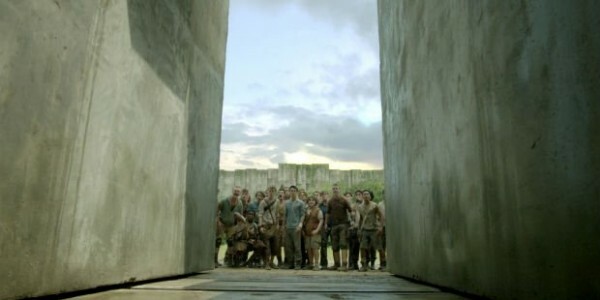 There are three rules to follow in The Glade, Alby (Aml Ameen) tells Thomas on his first day: do your part, don't hurt another Glader, and never go out into the Maze. It can be a bit of a clunky exposition dump at times ("Wait, did you just say 'maze'?" "What, did I?") and absolutely no one will be tricked into believing any grand metaphors about the boys' predicament (Lost's vague purgatory references this ain't), but for all of the mysteries and character introductions it sets up, it's a surprisingly swift opening act. And that's one of the film's best feats: ripping Dashner's sure-footed plot thrusts and pulling it off with aplomb. 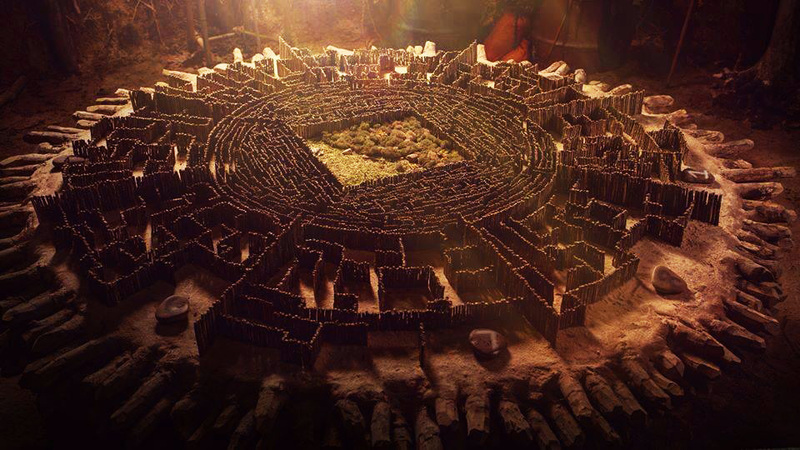 But it's when the film moves into the Maze itself that it truly shines. Ball, coming from a visual-effects background (this being his first feature) has a real knack for dilapidated landscapes. The Glade is beautiful (which is a masterwork unto itself as it was shot mostly in Baton Rouge - and as a Louisianian I can make that joke), but it's the far-off monolithic walls of the Maze that entrance. When Thomas takes a peek inside in the film's opening scene, we get a glimpse of its innards: vines of ivy criss-crossing on walls of varying heights, thick shrubbery gathering on the ground, growing and engulfing the heavy, industrial concrete walls. It's even creepier when Thomas sits at dinner with Newt (Thomas Brodie-Sangster), everyone except Thomas happily ignoring the shuddering, metallic clangs of the Maze shifting around all night, like the proverbial monster in your closet. When a breeze blows out through the massive door into Thomas and his new friend Chuck's (Blake Cooper) face, you almost want to flinch and cover your face alongside them. 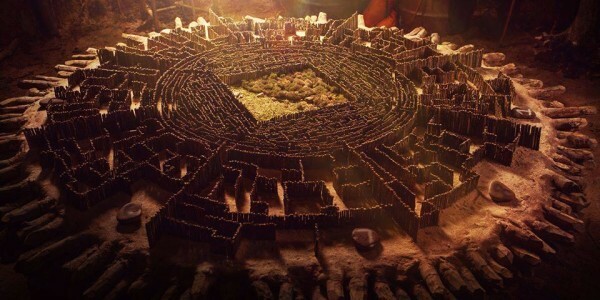 And when, in the second act, Thomas and Minho (Ki-hong Lee) appear to royally piss off the seemingly living labyrinth? Their sprint through its outer circles, narrowly dodging as huge chunks of concrete move and shift under their feet, is viscerally enthralling. In these moments, The Maze - with its corporate markings denoting specific sections, overrun wildlife, and general endless grandiosity - evokes an uncanny memory of the likes of Aperture Laboratories in Valve's Portal games. It's that perfect juxtaposition of the mundane (an almost corporate, industrial setting) and the insane (cyborg spider monsters eating children in a maze). And man, does it work. The Grievers themselves are niftily realized, as well, for being a concept that's barely provided any meat in the source material. Their rat-like faces, sluggish bodies, and arachnid appendages combine for an intimidating, terrifying foe. They are awkward in their lumbering, stumbling ways, and when they claw up a Maze wall after Thomas or barrel through a shack in the Glade, they are a terrifyingly tangible presence. With all of this, Ball's visual effects artistry goes unquestioned, but he also proves himself a damn good action director. Everyone's game, too. O'Brien makes a nice break from his usual joke-cracking side-kick role on MTV's Teen Wolf and grounds most of the film, despite his personality getting a bit lost in the jumble of his overriding urgency to escape the Maze. 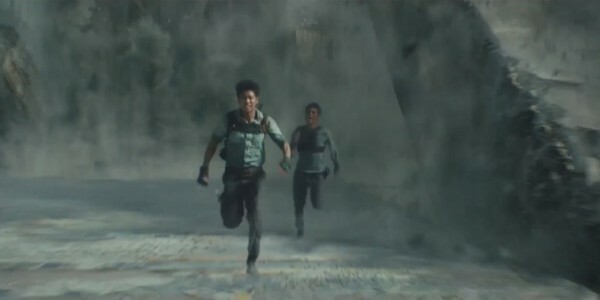 A majority of the background Gladers are given nothing more than yelling to do, but a select few are nicely realized versions of their novel counterparts. 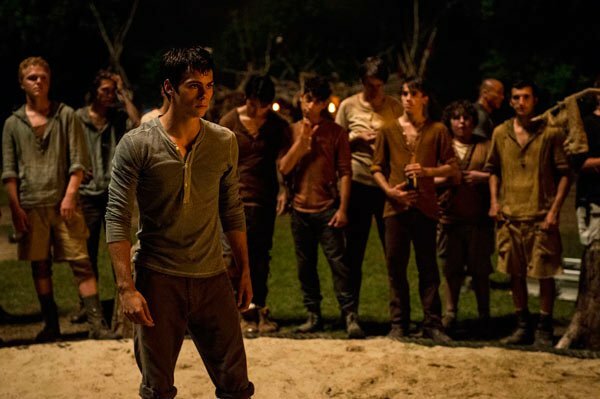 Ameen's Alby as the first boy to enter the Glade, and thus its leader, is great. So is Game of Throne's Brodie-Sangster as Newt, one of Thomas' fast-friends. Will Poulter's Gally easily plays up the frenemy role without resorting to annoying measures. Most grievous of all, however, is Kaya Scodelario's Teresa. She simply doesn't have anything to do here, much like the book. She's a terrific actress as Skins fans all know, but the story simply demands nothing from her at this stage in the game, much like Gale in the first Hunger Games flick. While the depths of their characters may be a cause for concern, it doesn't really matter once they stop talking and start fighting or running or screaming or banishing one another to die in the Maze. It's here they portray a convincingly off-putting brutality. From falls that made me flinch to blunt-force weapon trauma and plenty of run-for-your-literal-life moments, all the Gladers portray the duality of blissful domesticity and animal savagery surprisingly well. And then the final act comes. The novel's basic ending structure is kept intact, with a few changes made that make sense for the visual medium. Comparing the two versions, there's definitely a more realistic, groundedness to the film's final act (and the movie as a whole) compared to the book. Which may be the cause for its awkwardly executed third act. When it finally tells you everything you asked in the first half, it's a bit of an "Oh", rather than an "OMG." Despite, even, the appearance of a great character actor whose name I won't mention here. In written form, the book got away with its high flights of fancy, and the heightened, zany ending worked because of it. The film's decidedly darker and serious approach, while endlessly engaging, results in a movie that feels two-thirds finished. 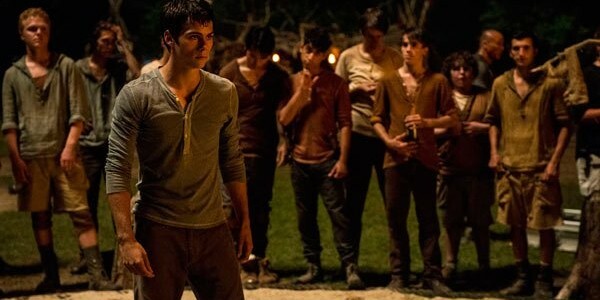 But, really, there's far more to like in The Maze Runner than not. It's brisk, blistering at times even, it's fun despite its serious tone, and it thankfully retains its source material's flair for the weird. And that may be the film's best sleight of hand: it's derivative, sure, with all the characters and their inexplicably dumb names and well-known actress in the villainous role, no one will forget that, but it somehow manages to feel utterly unprecedented. The cliches are there, but its sheer oddness elevates it to be something more. It feels different, even brave at times. Sure its final minutes are more preoccupied with setting up the sequel than ending this one well, and book purists could have serious room for quarrel on some of its biggest liberties with the novel, but at the end of the day it's a competently made, exciting little slice of genre film-making. And it made a fan of the novel, who knows the detailed minutiae of everything that is to come, want to know more. What grander cause for celebration can there be? Imposing, tactile setting of the Maze is, and I say this un-ironically, a character unto itself.